In 1850 William Hepburn Russell and James Brown formed a company to deliver 600,000 pounds of government supplies to Santa Fe. Soon afterwards Russell began delivering supplies to Fort Hall. The freighting business was a great success and in 1854 he joined forces with two other businessmen, Alexander Majors and W. B. Waddell, to to start the company of Russell, Majors and Waddell. In 1860 Russell, Majors and Waddell established the Pony Express to deliver the mail. This involved setting up a string of over 100 relay stations from St. Joseph in Missouri to Sacramento in California, a distance of 1,966 miles. A notice appeared in a San Francisco newspaper: "Wanted. Young skinny wiry fellows, not over eighteen. Must be expert riders willing to risk death daily. Orphans preferred. Wages $25 per week." One of those who applied for a job as a pony express rider was William F. Cody. People were charged 5 dollars per half ounce to send their letters. Each rider rode a certain distance before handing the letters over to the next relay rider. The first batch of letters left St. Joseph on 3rd April, 1860 and arrived in Sacramento ten days later. 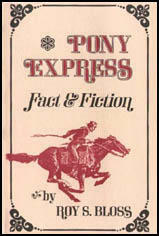 The Pony Express was initially a popular service. However, on 24th October 1861 a transcontinental telegraph was completed. Russell, Majors and Waddell could not compete with the electric telegraph and the Pony Express was closed down on 26th October. It was just after sunrise that the city of San Francisco hove in sight over the hills, and never did the night traveller approach a distant light, or the lonely mariner descry a sail, with more joy than did I the city of San Francisco on the morning of Sunday, October 10. As we neared the city we met milkmen and pleasure seekers taking their morning rides, looking on with wonderment as we rattled along at a tearing pace. Soon we struck the pavements, and, with a whip, crack, and bound, shot through the streets to our destination, to the great consternation of everything in the way and the no little surprise of everybody. Swiftly we whirled up one street and down another, and round the corners, until finally we drew up at the stage office in front of the Plaza, our driver giving a shrill blast of his horn and a nourish of triumph for the arrival of the first overland mail in San Francisco from St. Louis. But our work was not yet done. The mails must be delivered, and in a jiffy we were at the post office door, blowing the horn, howling and shouting for somebody to come and take the overland mail.